The Silvertree Trail will take you about 3 hours to complete and is 7.75 km long. It is a long, circular trail that crosses the entire Kirstenbosch estate via the 300 m contour path, from Cecilia Plantation in the south, up to Dassieklip and back along the lower contour path via Lubbert’s Gift. It starts and ends at Rycroft Gate (Gate 3) and passes through the shimmering silver trees (Leucadendron argenteum) that grow wild on the slopes behind and above the Garden. It offers wonderful views of the mountain, whose peaks and buttresses appear to change shape as you pass by underneath them, as well as panoramic views across the Cape Flats to the Hottentots Holland Mountains and False Bay. On this trail you can see the Garden’s irrigation dam, built in 1968 and enlarged in 1988. It holds 110 mega litres and collects water from Nursery Stream. Entry is prohibited. Take a short detour to see Vaalkat Waterfall, where Disa uniflora (red disa) can be seen flowering in late summer. 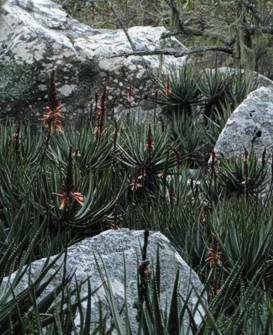 Near the highest point, Dassieklip, is a population of Aloe succotrina (fynbos aloe), which grows on rocky slopes from the Cape Peninsula to Mossel Bay and flowers in mid-winter. On the way down the path follows the old sleeppad, the path (pad) used by the early settlers to drag (sleep) the timber from the forest. This is the trail to follow if you are interested in the geology of Kirstenbosch and wish to see all the different kinds of rocks and rock formations.